EDXRF | XRF for Catalysts - Applied Rigaku Technologies, Inc.
Used catalytic converters are collected and recycled in order to reclaim the precious metals Pt, Rh and Pd. Typically, the entire honeycomb core is removed and ground into fine powder. Once in powder form, the precious metal catalysts can be extracted, or the powder can be sold to a refiner. The honeycomb core is typically ceramic, containing combinations of the elements Al, Si, Fe, Zn, Sr, Zr, Ba, La and Ce. 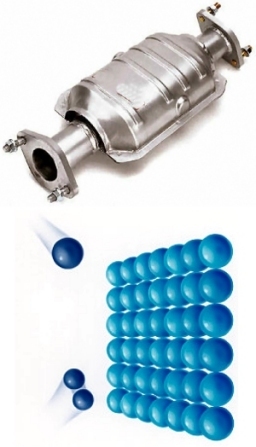 Some cores can be made of a stainless steel honeycomb and so would contain higher Fe and other metals. Catalyst material may also be high in Pb content, in regions where leaded gasoline is still used. Because all of these matrix elements can occur at various levels, the fundamental parameters software with matching Library offers quick direct analysis, of powdered catalytic converter cores, without the need for a large suite of calibration standards. The Rigaku NEX CG and the Rigaku NEX QC+ QuantEZ are especially recommended for this application. The Rigaku NEX CG EDXRF (XRF) is powered by a new qualitative and quantitative analytical software, RPF-SQX, that features Rigaku Profile Fitting (RPF) technology. This XRF software allows semi-quantitative analysis of almost all sample types without standards - and rigorous quantitative analysis with a few standards. Featuring Rigaku's famous Scatter FP XRF method, the software can automatically estimate the concentration of unobserved low atomic number elements (H to F) and provide appropriate corrections. 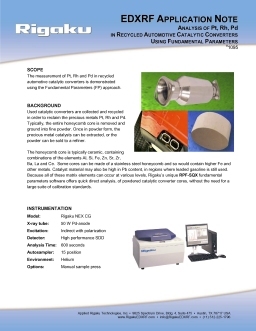 RPF-SQX greatly reduces the number of required standards, for a given level of calibration fit, as compared to conventional EDXRF (XRF) analytical software. As standards are expensive, and can be difficult to obtain for newly developed materials, the utility of having a Rigaku NEX CG EDXRF spectrometer can significantly lower costs and reduce workload requirements for routine elemental analysis needs.